Former British spy Christopher Steele lobbied a senior Justice Department (DOJ) official on behalf of a Russian oligarch before and during his work on the controversial opposition research dossier that accused the Trump campaign of colluding with Russia. Steele repeatedly advocated on behalf of Russian billionaire Oleg Deripaska in his communications with Associate Deputy Attorney General Bruce Ohr. Steele asked Ohr to monitor the status of Deripaska’s newly issued U.S. visa, informed Ohr that he was circulating a sensitive intelligence briefing that cast Deripaska as independent of the Kremlin, and sent information on behalf of the oligarch’s lawyer about a dispute between the billionaire’s company and Ukraine. The communications raise further questions about Steele’s objectivity as an intelligence source, and about Ohr’s motives for maintaining contact with a foreign ex-spy about a Russian billionaire, despite being assigned to a wholly unrelated line of work at the DOJ. Congressional investigators expect Ohr to appear for a closed-door interview on Aug. 28. The Washington Examiner was the first to publish excerpts of the emails relating to Deripaska. Steele brought up Deripaska in an email on Jan. 12, 2016, when the billionaire was applying for a visa to the United States. Deripaska was referred to as OD and OVD in different messages. “I heard from Adam WALDMAN yesterday that OD is applying for another official US visa ice [sic] APEC business at the end of February,” Steele wrote. Steele then asked Ohr to “monitor” the status of the oligarch’s visa case. “To the extent I can I will keep an eye on the situation,” Ohr replied. Two weeks later, on Feb. 21, 2016, Steele gave Ohr a heads-up about an inter-agency meeting on Deripaska that he expected Ohr to be a part of. Ahead of the meeting, Steele said he would be “circulating some recent sensitive Orbis reporting” on Deripaska, which showed that the billionaire was not a “tool” of the Kremlin. “We reckon therefore that the forthcoming [Deripaska] contact represents a good opportunity for the USG,” Steele concluded. Steele dated the first installment of the anti-Trump dossier of unverified dirt on the Trump campaign on June 20. Less than two weeks later, on July 1, the ex-spy brought up then-candidate Donald Trump in an email. Days later, Steele would meet with the FBI for the first time about the dossier. “There is something separate I wanted to discuss with you informally and separately. It concerns our favourite business tycoon!” Steele wrote. While it is possible that “our favourite business tycoon” was a reference to someone other than Trump, the chances are slim considering the confluence of events. Ohr and Steele went on to exchange emails over the next three months. The pair also met in person for breakfast in Washington on July 30. Ohr’s wife, Nellie Ohr, was present. Nellie Ohr worked for the same firm, Fusion GPS, that hired Steele to compile the dossier. A group of FBI and DOJ officials would go on to use the dossier to apply for and secure a warrant to spy on former Trump-campaign volunteer Carter Page. The Clinton campaign and the Democratic National Committee paid Fusion GPS for Steele’s work on the dossier. The document consists of a series of installments spanning 35 pages. Some allegations have been debunked, the rest remain unverified. By October, Ohr and Steele were back to discussing the Russian oligarch. Steele reached out to Ohr with an “urgent” matter, and a call was set up. The content of the discussion is unknown, but hours later, Steele emailed Ohr on behalf of Deripaska’s lawyer with information concerning a dispute between the Ukrainian government and the oligarch’s aluminum company. As noted by The Washington Examiner’s Byron York, the communications between Ohr and Steele line up closely with the dates on which Steele finished successive installments of the dossier. The exchanges about and apparent lobbying for Deripaska are only part of the questionable conduct revealed in the communications between Ohr and Steele. As The Epoch Times previously reported, Ohr tried to get reinstated Steele with the FBI after the bureau terminated the ex-spy for leaking to the media. Shortly after the FBI terminated Steele, Ohr, the No. 4 official at DOJ at the time, became Steele’s back channel to the bureau. The pair stayed in touch late into 2017, more than a year after the FBI prohibited Steele from collecting intelligence on its behalf. Steele’s known bias against Trump casts further suspicion on what took place beyond the emails. Ohr told the FBI that Steele “was desperate that Donald Trump not get elected and was passionate about him not being president.” While Steele compiled the dossier, Fusion GPS received money from Russia for a different project. “The big story that the Fake News Media refuses to report is lowlife Christopher Steele’s many meetings with Deputy A.G. Bruce Ohr and his beautiful wife, Nelly,” Trump wrote on Twitter on Aug. 11. “It was Fusion GPS that hired Steele to write the phony & discredited Dossier, paid for by Crooked Hillary & the DNC. Ohr was demoted twice after meetings between him and the figures connected to the anti-Trump dossier became public early this year. The DOJ declined to comment earlier this week. 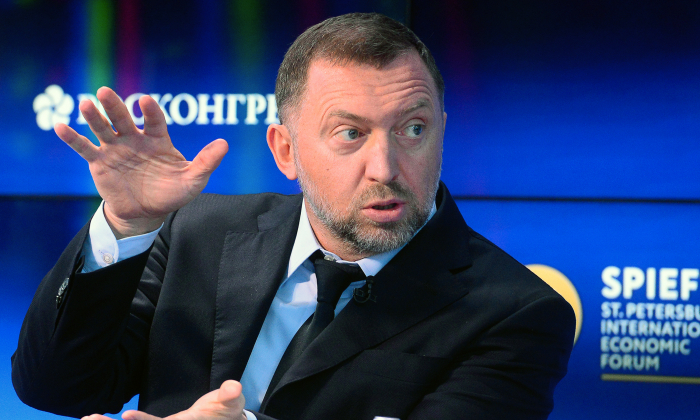 In April, the United States imposed sanctions against billionaire Deripaska and eight companies in which he is a large shareholder, including aluminum exporter Rusal, in response to what it termed “malign activities” by Russia. Sen. Lindsey Graham (R-S.C.) told “Fox News Sunday” that it was “at least unethical” for Ohr to communicate with Steele, since Ohr’s wife worked for the same firm that hired Steele to compile the anti-Trump dossier. “Mr. Ohr should not have had any role in investigating the Trump campaign,” Graham said.